A large myojin torii at the entrance to Meiji jingu. One can enter here immediately coming out of Harajuku station. You may notice the imperial crest on the upper portion of the gate which is common at imperial shrines--imperial shrines are denoted by the use of the word "jingu" instead of "jinja." 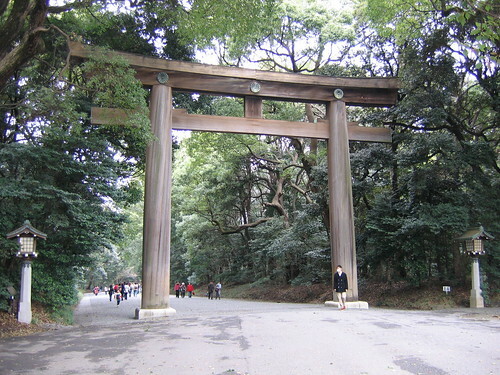 Meiji Shrine is the one of the largest and most important shrines in Tokyo. It was dedicated to the former emperor and his wife upon their deaths in the early 1900's. Much of the shrine was destroyed in the bombings of WWII, but it was mostly rebuilt in 1958. Meiji Shrine is located in the Yoyogi Park area on 175 acres of forest.